I’m not sure if I’ve confessed this before on the blog, but for most of my life, I’ve been what gardeners would call a Black Thumb. In other words, plants tend to die around me. And then there was the time I was digging with a hand-trowel, helping my mother and brother transplant some new seedlings from the nursery. While digging, I came across an earthworm that–in some strange wormy gymnastic maneuver– managed to hurl itself up in the air way too close to me for comfort. So for this post (and probably some future posts), I’ve decided to toss off my I’m-so-earthy-and-I’ve-always-been-this-way hat and give you the straight-up city girl’s guide to growing. Truth is, I still cringe slightly whenever husking an ear of wormy corn. (Never in front of customers: only at home.) Crusted poop on chick-butts no longer phases me, and there are a lot of things on the farm that I haven’t managed to kill — in fact, there are many things that have actually benefited from my thumb, whatever shade of green/brown/black it might be. Clearly, I’m making progress, but for now I’m going to tell you what I really think about summer squash — from the perspective of a currently opinionated, formerly suburban black thumb. You only have so much space in your garden. All summer long, zucchini will be a dime a dozen at the local supermarket. Recipes will flood local magazines and newspapers offering you 101 ways to get rid of your excess zucchini. (Hint: it does wonders for chocolate cake.) So, is it really worth your effort to plant zucchini — or any summer squash, for that matter? My answer: yes and no. No to green zucchini. Yes to yellow, zephyr (which I haven’t personally grown, but which is absolutely gorgeous and a number of farmers marketers have had good success with it), crookneck squash, and “patty pans,” aka flying saucers. Emmett says I’m biased against green zucchini. I am. First of all, it’s boring, and the grocery store is absolutely 100% guaranteed to have it — while the grocery store might not carry yellow, and probably won’t carry zephyrs, crooknecks, or flying saucers. Second of all, sometimes green zucchini can harbor a distinctive bitterness in the skin, especially as they get bigger. I find this flavor is less likely to occur in the yellow or zephyr zuchs. And thirdly, harvesting green zucchini is a royal pain in the you-know-what. Which is why I don’t like harvesting something that is the exact same color as the monster plant. In my sweaty, itchy harvesting angst, I’m way more likely to miss a zucchini that blends in perfectly with its surroundings. Missing a zucchini just once means we end up with humongous, bitter, seedy green zucchinis — they grow several inches per day, I swear — which slow the plantss production and end up in the compost pile. If you’re busy, and don’t like spending time in prickly bushes, trust me. Next year, plant yellows. 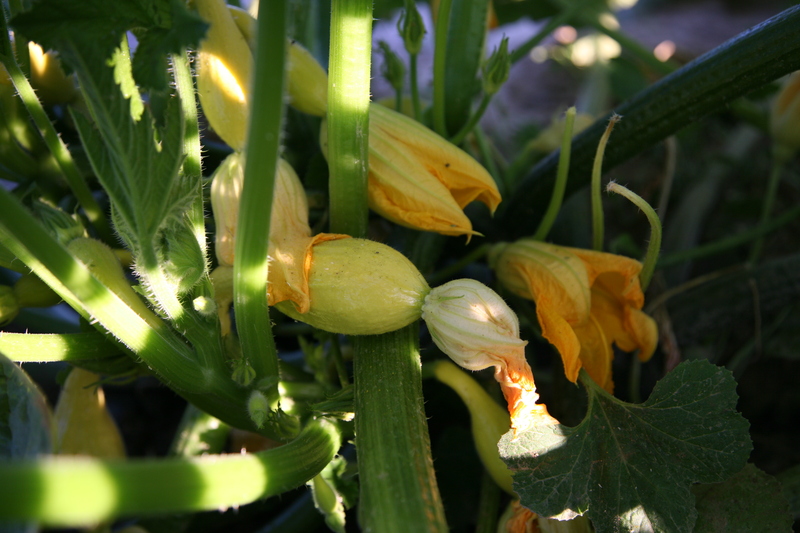 And crookneck squash, which are by far our most prolific summer squash. The heart of the plant almost looks like a snake’s den — brimming with curved, interlocked yellow babies. 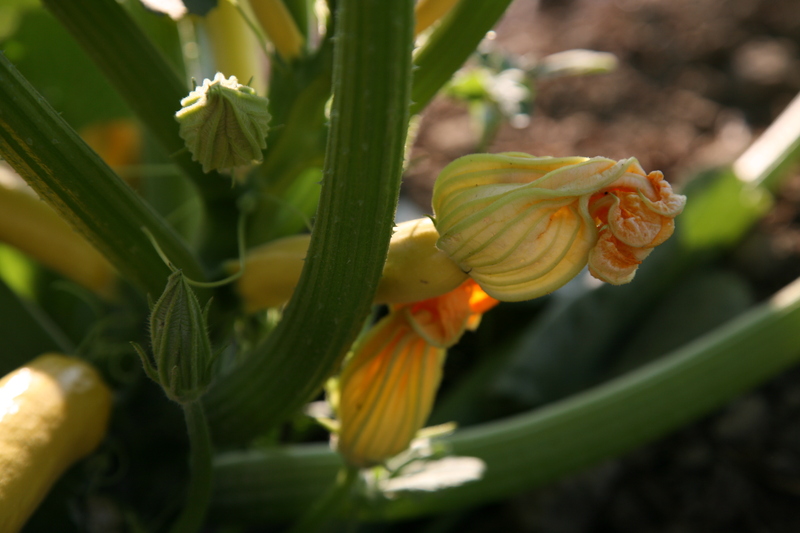 Harvested when young, crooknecks tasty in most dishes that call for zucchini — substitute away! They also make gorgeous aperitifs: slice them lengthwise so they look like cute little whales, place a sliced tomato on top, sprinkle with basil, garlic, olive oil, and a dash of balsalmic, bake in oven until slightly dehydrated and serve. They’re every bit as classy as cucumber sandwiches, so be sure to hold your pinky out when you eat them. Oh yeah, and did I mention that I didn’t manage to kill any of these plants — green, yellow, or patty-pan? The seeds are nice and big, which means you’ll be dealing with a fairly robust seedling, not a little wisp of a thing like lettuce or leeks. 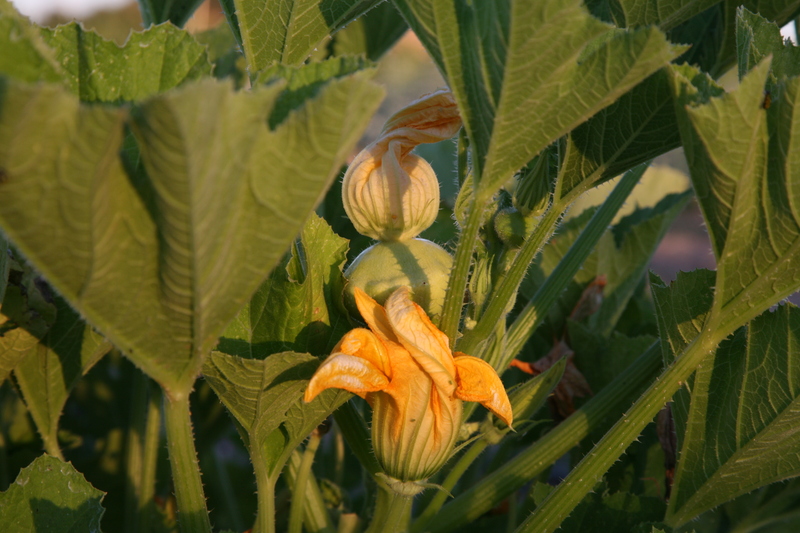 Give ’em some compost and plenty of water — and barring some strange disease (more on that when I discuss winter squash later), these plants should take off, and in fact just might take over your garden. Give them space, and come well-armored when it’s time to do battle with them!